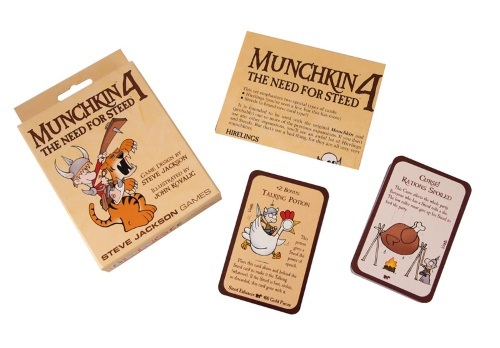 Munchkin 4: The Need for Steed is an expansion for the original Munchkin – 112 more cards for killing monsters, stealing treasure, and backstabbing your fellow players. This set introduces Steeds, the trusty mounts of legend... Oh, wait – this is Munchkin! So these Steeds include not just the Dragon and the Tiger, but the Giant Mutant Gerbil (drawn by guest artist Shaenon K. Garrity of Skin Horse), the Chicken, and Big Joe, who might be a Steed or might be a Hireling. It's hard to tell. 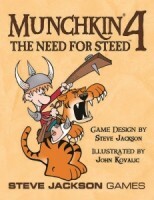 Add a Review for "Munchkin 4: The Need for Steed"